To help illustrate the practical application of the 'Transcendent Function' of the psyche, Jung makes an analogy between it and the mathematical function of the same name. Just as the mathematical Transcendent Function relates numerical elements both real and imaginary, the psychological Transcendent Function operates with elements of both conscious and subconscious (or unconscious, as Jung himself puts it) mind. There are few practical activities that embody this function as well as the playing of a musical instrument. In learning a new piece of music, the musician is in effect of process, moving information from the conscious mind into the subconscious. From input of ear or eye, whether listening to the piece or reading it from the page, the musician consciously formulates the desired sequence of notes and practices the performance thereof, going over it until he can play it without deliberate thought and analysis of each finger position required. That is to say, he rehearses it in consciousness until it is settled into subconsciousness, and it can be performed without the intervening layer of thought. As in many activities requiring a high degree of skill or coordination, playing a musical instrument is an activity in which 'thinking gets in the way.' That is to say, conscious analysis of every motor action required to extract the intended sequence of notes from an instrument is an overwhelming mental task that often (if not always) destroys the effectiveness of the intended task. The best moments come, according to musicians and athletes alike, when we stop thinking and simply act. The conscious mind is a poor driver for complex tasks. It simply cannot handle the coordination of multiple threads of action. It is a vital part of our existence, and a focal point of our awareness, to be sure, but to think of the conscious mind as the sum, or even primary constituent of our psychological makeup is pure folly. Imagine every automatic system in your body relied upon constant attention and intention to operate. Beat heart to provide more blood to muscles lift left leg by contraction of thigh muscles breathe deeper to provide proper oxygenation to blood analyze inner ear output correct body angle to avoid loss of balance beat heart again etcetera etcetera. I can't even concentrate on a bit of reading if there's an argument going on in the next room. For a little parable about the necessity of subconscious control of physiological function, see Ondine's Curse. The conscious mind is incapable of so much as riding a bicycle or making a left turn against traffic; to achieve any sort of coordinated activity, we rely upon the subconscious mind. 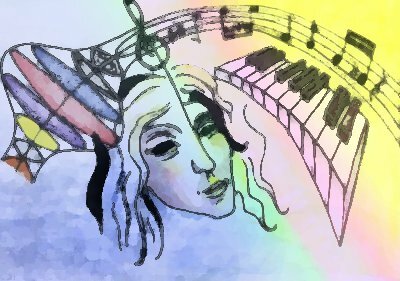 The goal of the musician is to open up pathways between the conscious and subconscious--to logically understand the piece, intentionally formulate the desired interplay between rhythm and melody, pass that information smoothly into the subconscious mind, and allow the subconscious to work with the physical body in order to produce the desired outcome. Sight reading must then be a rather high form of the Transcendent Function, for the musician is able to instantly pass information from the conscious analytical principle to the subconscious action principle with minimal interference. The Transcendent Function at work!